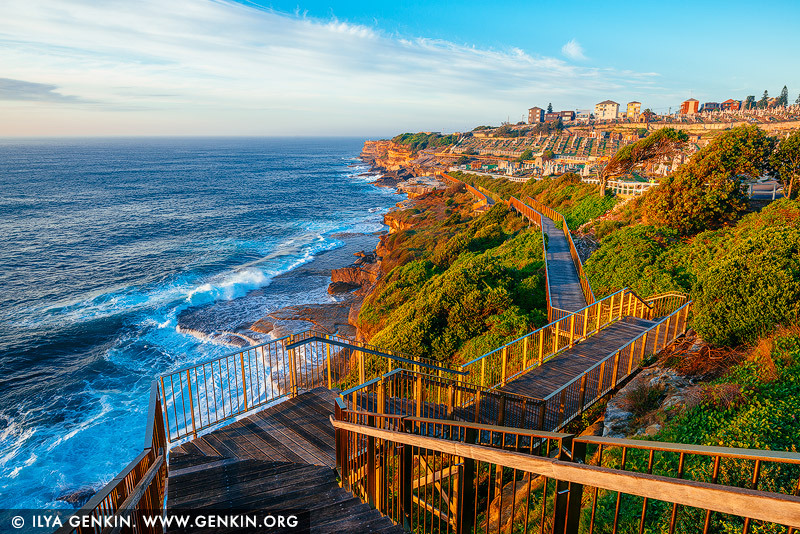 The Bondi to Coogee walk is perhaps the most famous coastal hiking trail in Sydney, New South Wales and perhaps even Australia. Tourists from all over the world and local Sydney-siders alike come to Sydney's east coast every day to enjoy Australia's best beaches, stunning ocean views and lots of parks, cafe's and restaurants on the way from Bondi Beach to Coogee Beach. The beaches and parks offer a place to rest, swim or a chance to eat at one of the cafes, hotels, restaurants or takeaways. All beaches offer picnic shelters, electric barbecues, play areas, kiosks, toilets and change-rooms. The walk is not difficult, there are medium gradient paths and several staircases with occasional seating. It takes about two hours to complete the Bondi to Coogee Beach section of the walk and another hour and a half if you choose to continue to Maroubra. This image belongs to the travel and nature stock photo library. This stock photo of Bondi to Coogee Coastal Walk at Sunrise #1 is available for licensing for commercial and editorial uses including websites, blogs, books, magazines, brochures and advertising. Restrictions may apply for images which contain third party copyrighted material or sensitive subjects. Photos of artwork are for editorial use only. This image id AU-BONDI-TO-COOGEE-WALK-0001 of Bondi to Coogee Coastal Walk at Sunrise #1, is copyrighted © by Ilya Genkin. This is not a public domain image.